My 20-month old is busy, busy, busy and not much holds his attention for very long! That being said, reading and religion are two very important things to me, and things I want him to grow up focusing on. 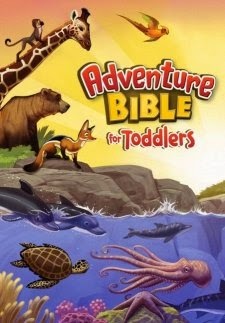 When I received the Adventure Bible for Toddlers I was very impressed with it! It is a board book material, so his wiggly little hands will not rip the pages out, and it is also very bright and colorful! These colors do manage to hold his attention a little longer than other books have! I also love that each story is kept very short, so we can read one and let him down to run around in circles before we do another bible story. The author of this bible definitely kept busy toddlers in mind when they created it, and it is all around the perfect bible for little ones. My older son (7) loves to read this bible to his brother too! This is the perfect baby shower gift or even first or second birthday gift for an active little one! It has a very pretty cover! I will have to check it out too, but it looks like it would be a great gift!